At six mana, some players who have been around for a longer time will probably compare this card to M11’s Titans, which is actually not that relevant a comparison. Titans are blunt instruments of card advantage, while Dream Eater is a much more subtle – a much more Dimir-esque – card. It plays well in decks that need card selection, as there are few surveil cards that have higher numbers than it does and control decks won’t care about sending irrelevant cards to the graveyard by that stage of the game. It plays well in deck that need cards in the graveyard in general, as it can put a lot of card into your graveyard at one time and set up a big finish. And at worst, it bounces something dangerous and presents a threatening creature to the opponent – cards like this are an outstanding response to a planeswalker that’s about to go ultimate on their controller’s next turn. My suspicion here is that Dream Eater is a mythic purely for power level reasons. Even at 6 mana, this card is rather powerful. Let’s go through what this has: a 4/3 flying body, flash, Disperse stapled to it, and “scry” 4. That’s a lot to pack into one card, and 6 mana is a fair cost for all of this (even if the body dies to Lightning Bolt/Strike). You can drop this into combat to bounce an opponent’s creature and block another, a nice 2-for-1 when it is least expected, and the surveil is also relevant. This set has a number of graveyard-synergy cards running around between Izzet and Golgari alone, as well as payoff cards that like to be milled, so this is definitely stronger than scry 4. But seeing that far into your library is definitely not common on any card, and dropping 4 cards into the yard can have its upside! 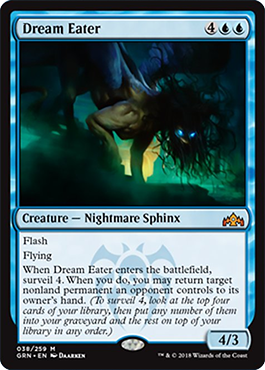 Dream Eater is powerful, though six mana makes it a bit awkward. I would be shocked, though, if this does not see a lot of Standard play, as it packs a lot of card into one card.